Pro Skateboarder Tony Hawk uses his celebrity status to teach kids about the dangers of using tobacco. -- This tobacco-free sports poster featuring Olympic gold medalists Picabo Street (Alpine skiing) and Dominique Dawes (gymnastics), Oregon State University football star Ken Simonton, Brazilian soccer star Sisi, and World Cup champion mountain biker Alison Dunlap emphasizes that you cannot excel in sports by using tobacco. Produced by CDC, World Health Organization, Tobacco Free Sports. -- Don't start. Be Free! Cigarette makers are out to get you. They need to hook new customers like you to replace the 10,000 who die every day. Don't start. Be Free! Full-color poster produced by Centers for Disease Control and Prevention, American Cancer Society, U.S. Department of Health and Human Services, Tobacco Free Sports. 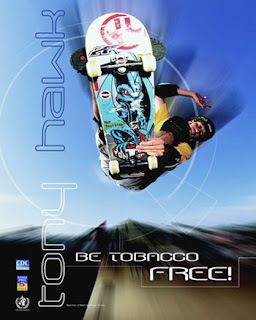 ♦ Tony Hawk - Be tobacco free! -- Pro-skateboarder Tony Hawk, who started the extreme sports movement, has turned away big-money offers from tobacco companies. This poster featuring Hawk in action clearly demonstrates that this mega sports star would rather use his celebrity status to teach kids about the dangers of using tobacco. -- Sports activities are still a great way to reach our nation's young people with information about how to make important health decisions related to tobacco use, phys­ical activity, and nutrition. Because health behaviors are usually established in childhood, positive choices must be promoted and reinforced before damaging behaviors start or become habits. Ordered this for Chris, a huge Tony Hawkes fan, on Oct 11/08 - looked at their other posters and ordered two more. They say up to 5 items for free, anywhere in the world.